Winter brings plenty of cold weather dangers to construction sites. Even though the official start of winter is more than a month away (Dec. 21, if you’re wondering), construction site managers need to start considering the dangers that come with increasingly cold weather. Prolonged exposure to cold weather, snow and ice all make a construction site more dangerous, but these dangers can be dealt with if recognized. Just like with extreme heat, extreme cold makes for a challenging work environment. 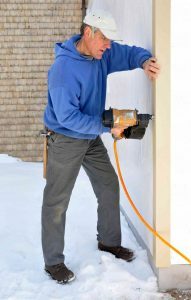 Temperatures around freezing are dangerous enough, but add the physically taxing work of construction that leads to sweating and you have a recipe for seriously concerning heat loss. Dangers like hypothermia and frostbite can happen on regular worksites, they aren’t unique to places with extreme weather. Prolonged exposure to low temperature is the real danger here. We all know how big of a danger falls are on construction sites. Add in a slippery surface like ice and you’re only making an already dangerous situation worse. Whether it’s working on scaffolding or a lift or boom, snow and ice can conceal tripping hazards and make working at any height dangerous. It’s best to make sure walkways are cleared and de-icer is spread early and often. Just because you might not be driving on a road doesn’t mean you can forget about safe winter driving practices. Snowy and icy roads are naturally dangerous, and construction equipment generally isn’t as agile as other vehicles. Transportation drivers need to be aware of the risks winter driving presents, too. This entry was posted on Friday, November 11th, 2016	at 9:38 am	. Both comments and pings are currently closed.